The GOLDEN line of Airbrush Colors are engineered to meet the highest standards of professionals, for use in airbrush, brush and technical pen. They offer the ability to create opaque, high intensity colors for illustration and fine art purposes. GOLDEN Airbrush Colors are formulated from a 100% water-based acrylic emulsion, incorporating only the most lightfast pigments available. This results in exceptional permanency and performance. The acrylic binder system allows for excellent chemical resistance, yielding a durable film that will not be damaged by water or ammonia. 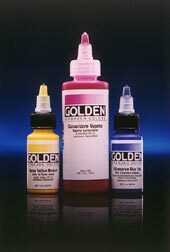 GOLDEN also produces other full lines of acrylic paints, including Heavy Body, and Fluid Acrylics, that are compatible with the Airbrush Colors. These products can be used in conjunction with the Airbrush Colors to combine the effects of spraying with those of other application techniques, while working with the same color. When mixed with GOLDEN Airbrush Medium, the Fluid Acrylics perform very well for airbrushing, offering the artist still further choices in color selection. Please note that Golden Opaque Airbrush Colors are not for use on garments. For Applying GOLDEN Acrylics to Fabric, GOLDEN Fluid Acrylics blended with GOLDEN Airbrush Medium yields a paint system that is very durable in normal laundering, and that does not require heat-setting (however, ironing will increase performance). Golden airbrush colors are a favorite with our customers for their opacity and non-clogging qualities, especially at 30% OFF! GOLDEN has long been in the forefront of environmental stewardship in the art supplies industry. All of their formulations are geared toward environmental friendliness. This includes everything from the ingredients that go in their paints to the wastewater they generate making their paints as well as cleaning out equipment. They have recieved an Environmental Investment Program Incentive from Empire State Development (ESD). The Empire State Development’s Incentive Proposal will help GOLDEN proceed with its proposed water-recycling initiative to install a Reverse Osmosis System, which will allow GOLDEN to reuse its wash water in their Columbus, New York facility. And since their products are produced here in the USA, less energy is used in transport. All of the colors in this line conform to ASTM D 4236. Please note: The colors below are electronic approximations of the actual colors and may not match exactly. Please use for reference only.